Which Is A More Accurate Term: Christian Or Disciple? We all have some way of self-identifying: “I am a husband. I am a wife. I am so-and-so’s daughter/son. I am a parent, grandparent. I am (fill in the blank).” Self-identifications such as this is a good way to identify our roles–at home, work, community, family, church, etc. If you consider Jesus to be your Savior, then how do you usually identify yourself: a Christian or a Disciple? I know, I know, it sounds like I am about to strain at a gnat just to swallow a camel. You may be thinking, “What difference does that make? There’s more important issues going on in the world, in our nation that needs to be address. Christian or Disciple, really?” Yes, really! We find the first use of this word “christian” in Acts 11:26–The disciples were called Christians first at Antioch. Well, well, well, it seems that Jesus did not use that word “christian”. The Greek word is “christianos“ and it means “follower of Christ”. And it seems that this word “christianos” is used only 2 other times in the New Testament. Could it be, mind you I’m only asking a question, could it be that the word “christian” should not be our first choice of words when self-identifying with Jesus? Do you remember when you were in school and the teacher said those 7 most feared words? “Take out a clean sheet of paper.” It mean it was time for a test, pop quiz or announced. When listening to Jesus, we need a clean sheet of paper. Not for the test, that comes later. But we need to listen with an open heart and open mind. We need to listen to Him directly; not what someone else said about what He said. We need to approach each passage as if it were the first time we read it. Listen to God’s mind and heart. There are some “deep” passages, but what we need for life–for our role and purpose isn’t rocket surgery or brain science. You just need to listen. Don’t be like you were when you were a kid and your parent was talking to you. You know, letting it go in one ear and out the other. Begin to uncover and discover how the Good News is designed to work in our life. Memorization is a tool, a very good tool, but go deeper. There is a wisdom in God’s Truth that we need to accept and embrace in our journey through this life. Explore how this Good News can make a difference in your life. I once heard this illustration. When a duck dives into the water for food, it comes back up at a different place. Internal transformation is the beginning point and the source of the Power that comes only from the Holy Spirit. Information and knowledge are not enough. The key is application. It has been said, and very well I might add, that Wisdom is the APPLICATION of knowledge. Unfortunately, the cultural church has been inundated with the Intelligentsia. The Intelligentsia is a status class of educated people engaged in the complex mental labors that critique, guide, and lead in shaping the culture and politics of their society. In others words, lots of thinking and talking but not a whole lot of doing. Someone once told me that C. S. Lewis defined The Intelligentsia as people who are educated beyond their intelligence. I cannot verify C. S. said it, but I know more than a few that meets that definition of The Intelligentsia. The goal of Jesus’ teachings was APPLICATION. Once a student listens, then learns, they are now ready to apply that knowledge. Knowledge with application is like a coke (I’m from the south, so the word ‘coke’ refers to a variety of different brands) without the carbonated water–it’s flat and loses its true taste. Jesus wants Disciples, after all that was His invitation. People who will listen, learn and apply The Good News of The Kingdom of God. Being a Disciple isn’t a title–It is our role and purpose. This is just me, OK? If I believe the writers of the New Testament chose their words carefully (and I do believe that), if Jesus never asked for people to become christians (and He didn’t), then maybe I need to self-identify as DISCIPLE. Yep, I think I will do just that! We urgently need more martyrs today! Can you imagine the revival that would happen in the U.S. if “Comfortable Christians”, Tenured Pew Sitters, Churchians and others who are more focused on their little piece of the church than the Kingdom of God would embrace J.D.’s challenge? OK, I’m not doing this to start a theological debate, doctrinal fight, nor a “Roman Catholic” versus “Protestant” argument. It really is just a question: “Where did the concept of the ‘Apostolic Age’ come from?” I’ve had the mandatory seminary classes on church history, and I know the traditional thought about this alleged Apostolic Age. 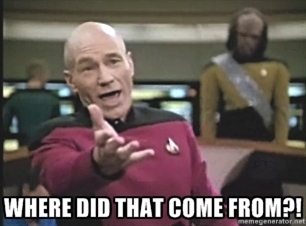 But when and where did this concept of an alleged The Apostolic Age originate? And I know that the consensus is it ended with the death of John. Many teach and many more believe that it was limited to those Original 12, well, excluding Judas. 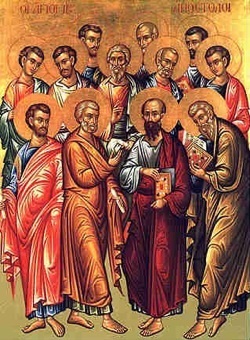 But according to Matthew 10:2-4, Judas is listed as one of the 12, you guessed it, “Apostles”. but were there just those 12, including Judas? Well, maybe including Paul there were 13 “Apostles”. Perhaps we could add Barnabas to make an even 14. Maybe we could add Silas for 15. Some might have a good argument to include Timothy as an “Apostle”, making the number an even 16 “Apostles”. Could it be this “Apostolic Age” is the result of the interpretation of History? I know, I know, most want history to be just the facts. Yet most of written history includes the result of human interpretation. And herein lies my contention: Is the concept of this alleged “Apostolic Age” the result of human interpretation? Now please understand, I’m not asking you to agree with my hypothesis, theory and conclusion. I am asking that you simply think for yourself, and then draw your own conclusion. I have a “Leroy Jethro Gibbs” gut feeling some of the comments may disagree with me, or some might stop following this blog. I’m OK with this, as long as you are thinking and seeking the Holy Spirit. Me? I’m a KISS kind of man–Keep It Simple Stupid! With this as my backdrop, let me frame these words as best I can. My Hypothesis: Our God is a “Sending God”. It is His nature and His deepest desire to send out His heart and message to redeem and restore fallen humanity; the ones who alone bear His image. My Theory: He sends others that He has redeemed and restored to Himself for the purpose of redeeming and restoring others. Don’t try to sell me on the benefits of a Ford if you are only driving Chevrolets. If you want to reach deep into me, tell me what (or whom) is deep inside you. My Conclusion: Because God is still reaching out to His Fallen Image Bearers through those whom HE sends, this thing called The Apostolic Age as defined by historians, hasn’t really ended. Furthermore, I assert this concept of an “apostolic age” to be anathema and has robbed the Body of Christ of it’s most basic identity–that of being a sent people. The result of no longer living with that sense of being “sent”, most, especially Churchians and Tenured Pew Sitters, are living with a sense of being settled. And that, my blogging friends, is one of the worst tragedies; for a people who were redeemed and restored in order to be sent, to accept being settled. So, why isn’t an apostle (lowercase “a”) simply someone sent as a messenger to go to an appointed place with The Message? If my hypothesis is true, that God is the Sending God, doesn’t this mean He is still sending today? Tomorrow? Next week? Next month? Now this left-handed, right-brained preacher is about to put it into overdrive. What if we forgot about this “historical” image of an alleged long gone “Apostolic Age” and began living our lives right now as apostles (note the lowercase “a”)? Live as people who are sent to a certain place with a certain message? Can you imagine the transformation that could happen? I now see myself as an apostle–but not with the delusions of grandeur. I see myself as one who is being sent with a Message to specific places and people. And you do not have to be a pastor, preacher, evangelist or missionary to be “sent” somewhere. God is looking for people to send to specific places. Those places are where there are human hearts and lives, made in God’s image, that need to be redeemed and restored to the Father’s Glory. God is looking to send someone across your street. God is looking to send someone across the aisle, across the hall, across town, across county lines, and who knows, maybe across the state or across the world. Sent people are never settled people. They are ready and willing to go into every human situation with the Message of The Good News, this Kingdom News that redemption and restoration are now available to anyone and everyone. First these 12 were disciples before they were apostles (lowercase “a”, please). They learned from Jesus and then they went. How I pray for more people to live first as disciples, then go as apostles–people sent on a Mission from God! If you live with that sense of being sent, then the Apostolic Age isn’t over. How sad it must be to think God has stopped sending ordinary people to do extraordinary things. Nothing is more miraculous nor extraordinary than when another heart has been redeemed and restored by The Maker, our God who sends! I may not have convinced a single person that this alleged “Apostolic Age” thing is a human concept. But if there is just one of you who are now thinking, “Could God be sending me somewhere?”, then it has been worth it! It is both overwhleming and liberating to know that we can be “sent”. And it is a prison all it’s own, to be simply settled where you are. Still think that the Apostolic Age is over??? Let’s pick up where I left off yesterday. Every church of every tradition and size has only one mission from God: To Make More Followers For Jesus. This is why every church exists. It’s not to serve us, but to give us a place to serve God through serving others. The vision must be to serve the mission of making Followers for Jesus at all costs. Folks, we have made church more complicated that it really is. There is a simplified way to make followers for Jesus! We live with the confidence that He actually is present with us. Only His presence gives us the passion, the desire to do what we are redeemed to do. The Holy Spirit is who sets our hearts on fire. If Jesus has never done anything for you, then there is no fire in our hearts. But we can have a fire when we realize what God has done for us. We can have a fire when we realize what God is doing for us. We can have a fire when we realize what God will do for us. And what has God done for you? He has nailed your sins to the cross and you bear them no more! What is God doing for you? He is at work transforming you and your moments for your good and His glory. What will God do for you? Stay by your side until you as you live forever in His Kingdom! To make another Follower of Jesus doesn’t take a committee nor a team, but the passionate conviction that God has been, is now, and will continue to be present and at work in your life. The Passion To Make Followers Comes From Knowing The Presence Of Jesus. The source of our power is the Holy Spirit. Have you ever been surprised or amazed by something you did or said? Then afterwards you wondered, “Well where did that come from?” Those are moments when HE has complete control of us. It is so important that we stop relying on our abilities by living in His power. Do you know why some meetings are irrelevant, dull and boring? It’s because we have forgotten the real power of the Church. Whatever it is that God calls you to do, He will give you the strength and power to do it. To engage our heart in what God is doing, we have to know the Provision of spiritual gifts that are designed by God for the common good. The gift God gives you is designed so that you are able to help others both inside and outside of the church. The Work Of The Body Of Christ Is A Spiritual Work And Requires Spiritual Tools. These provisions are not rewards for us being good, but they are the result of our God being awesome! God Gives Us The Tools We Need Not To DO Church Work, But To BE The Church That Is The Body Of Christ In Your World. You have to know your spiritual gifts. God does reveal your spiritual gifts. If you do not know your Gifts it’s your fault. It’s not easy, but it’s not hard. I know, I know, I’m sounding like a politician. You’re thinking if it’s not hard, then it is easy, but if it’s not easy then it must be hard. If you think it’s too hard to do the ONE thing God wants this place to do, then remember Genesis 18:14—Is anything too hard for the Lord? God had just told Abraham that he and Sarah would have a son within a year. He was an old man and she was an old woman. Looking at them, you would be right to believe that they were too old to have a child. It was impossible for them. But do you know what? By the next year, they had a son. Nothing, and I mean NOTHING is too hard for the Lord. All you have to do is Trust Him with all your heart. When you give Him all of your heart, over and over again, when you worship Him with all of your heart, when you listen to Him with all of your heart discovering the truth about God, the world and yourself, here is what you will discover: God Is Making Available To Us His Presence, Power And Provisions To Fulfill Our Primary Task in His Kingdom And That Is To Make More Followers For Jesus! Failure To Do This Is Failure To Love God, Worship God and really, Failure To Know God. Pursuing the heart of God means that after surrender, after worship, after studying The Word, we must be doing the things that will make disciples of others, which will bring them into this process of surrender, worship, study and doing! This is the cycle of Kingdom Life. You and I NEED His Presence. You and I NEED His Power in order to be faithful to our Primary Task. And You and I NEED what He alone can provide to be more than disciples of Jesus in name only, to be real Followers of Jesus by doing what HE wants done. 1-3 What I want to talk about now is the various ways God’s Spirit gets worked into our lives. This is complex and often misunderstood, but I want you to be informed and knowledgeable. Remember how you were when you didn’t know God, led from one phony god to another, never knowing what you were doing, just doing it because everybody else did it? It’s different in this life. God wants us to use our intelligence, to seek to understand as well as we can. For instance, by using your heads, you know perfectly well that the Spirit of God would never prompt anyone to say “Jesus be damned!” Nor would anyone be inclined to say “Jesus is Master!” without the insight of the Holy Spirit. Think about the things that make up our day to day ordinary life. What is the story that you are telling your world and culture? In the beginning of the Body of Christ, the vast majority of disciples understood they lacked the moxie to do what God was calling them to do. The result was they opened their heart, mind and life to God so that HE could equip them with what was needed for this enormous task of being the presence of Jesus in a fallen world. And God provided what they needed through His Spiritual Gifts. And I Believe That Today God Is Still Making Available To Us His Presence, Power And Provisions To Fulfill Our Primary Task in His Kingdom And That Is To Make More Followers For Jesus! These gifts are not merit badges or rewards for us being so good. Spiritual Gifts are the only way to fulfill our primary task as Followers of Jesus in the Body of Christ, which is to make more disciples for Jesus. Let me tell you a story. After Satan could not convince Jesus to avoid the Cross, he began to worry. After Jesus conquered death, Satan began to wonder how he could stop the Gospel. Eager to please their master, demons did a variety of things. One began to persecute the believers, even having them killed. But this only led to the Gospel being spread out further. Another tried to get the early church to dilute the Gospel by mixing it with other beliefs and religions, and while it did capture a few souls, it wasn’t the huge success he was wanting. The Gospel continued moving forward. The demons tried and persisted with their evil designs. At times they seemed to be successful by getting the church to replace relationship with rituals and rules. The demon explained—“It’s a group of people who sit around talking about what they should be doing. The key concept is ‘talking’. Committees will then insist that everything in their area has to done their way; this will stifle creativity. Some churches will make it that only a committee can do something in their areas, this will create a spectator mentality. If some people don’t get on a committee, or a particular committee, they will get angry and stir up trouble, this fuels selfishness. Committee meetings will become irrelevant, long, boring, or heated, and eventually, all of the above and this creates division.” The Board room of hell was silent, until they saw their master with his infamous sly grin. And though they couldn’t stop the power of the Gospel, they had found a way to slow down a church by making it ineffective. From my story you may think that I don’t like committees. I want to set the record straight. I don’t like committees. I don’t like committees that talk more than they do, stifles creativity, creates spectator mentalities, fuels selfishness and creates division. But I am not against having committees. But because of the well-earned reputation of committees, I prefer to form teams. I am against the thought that the vision and mission of the church is to serve committees or teams. This happens when more emphasis is put on committees and teams rather than the mission. If you’re on a committee/team and I’ve made you mad, just listen to one more thing—The purpose of our Committees and Teams is to serve the vision and mission of the church. That’s all. Now that I’ve adequately offended some of you readers, I have something more to say. Every church of every tradition and size has only one mission from God: To Make More Followers For Jesus. This is why every church exists. It’s not to serve us, but to give us a place to serve God through serving others. The vision must be to serve the mission of making Followers for Jesus at all costs. Folks, we have made church more complicated that it really is. To understand how to simplify this, read the next edition!